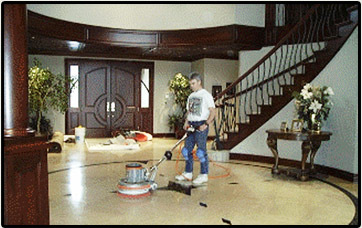 Oregon Marble Refinishing is a natural stone restoration company. We refinish stone floors, countertops, tables, mantels, showers, tub decks, etc. We specialize in marble polishing, marble honing, marble cleaning, limestone polishing, limestone honing, travertine polishing, travertine honing, floor honing, floor polishing, floor cleaning and sealing, floor grinding (to remove lippage), granite polishing, granite honing and sealing. In addition to marble, limestone, travertine and granite, we also work on slate, onyx, basalt and other natural stone. We are dedicated solely to the restoration of natural stone, we do not sell, fabricate or install. Commercial and residential accounts welcome. References are available upon request. We are licensed; CCB# 133986, bonded and insured. We are certified Dry-Treat™ applicators. We take pride in the quality of our work and strive, to the best of our abilities, to give our clients the desired results that they want to achieve. We have over 10 years experience in natural stone refinishing in the Portland metro area. slate, travertine and others. Floors, countertops, tables, showers, tub decks and more...."